One of the things that you want to make sure that you do right is to prepare your preteen or adolescent for the high school environment. With all of the standardized testing that goes on at this level, as well as preparation for high school exams and college, athletic events, and various extra curricular activities, it can seem overwhelming to the average student. Time management is one of the most crucial and essential but often-overlooked factors in the success of students on the high school level. Learning to use time wisely is a life skill that should be learned at the earliest age possible. Students are required to juggle a great deal of activities, special projects and other events, so help them create a schedule when they first start high school that will include a wide variety of activities in which they want to participate. Don’t forget to leave some important time for themselves and family activities. High school is the preparation and training ground for college, work and life. Sit down with your preteen and talk to him about what he wants to do for a career once he finishes high school. Some students do not want to go to college or secondary training after school. They prefer to work and gain life skills that will help them with specific career choices. With so many learning opportunities available, this is a viable option. Conflicts may arise when parents do not agree with their children’s choices. It is important to realize that these are their choices. Talking to your preteen early in the game, preferably before his entrance into the high school environment, may help with this transition. Organization is important as students get older and they have to complete a number of different tasks by certain dates. Give your preteen a calendar or scheduler that will enable her to know her schedule for any given day. Some schools allow the use of mobile devices, so you could use an app instead. Some schools have mentoring programs that allow older students in high school to mentor younger kids. If no such problem exists in your school, consider starting one on your own with the PTO’s help. Alternatively, connect with a parent that has an older student willing to pair up with your child to show him around as they first start to high school. This one action could give him a sense of confidence since he will have someone more experienced to lead them through the process when they first get to the new building. Parents who get involved in the happenings of their school are more likely to be able to help their children make it through this transition in a smoother manner. They are more knowledgeable about how the school operates as a whole, they know resources such as the counselor and others who can help them and they are more able to connect their children to the needed help if they start struggling when they reach high school. Parental involvement is key, so get involved and contact your school’s counselor for more information. 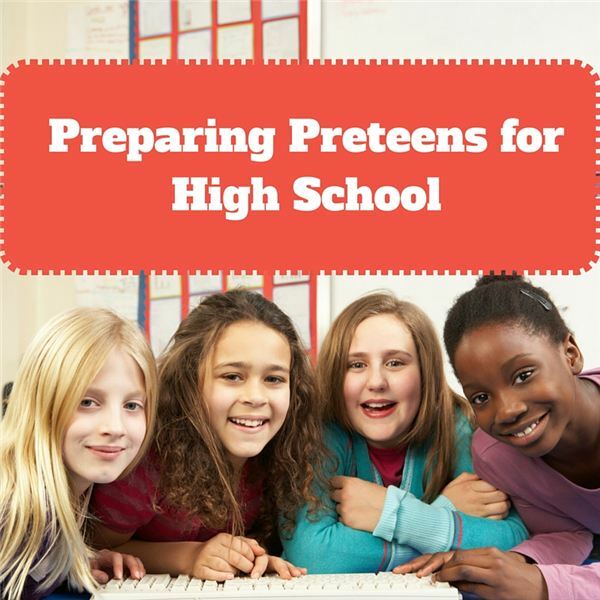 Transitioning to high school is a big deal for preteens and adolescents. It can be a very scary time for your child. They worry most about friends, associations, changes, acceptance and success. Some also worry about bullying, grades and other activities that are important to them. They want to succeed but they often don’t know if they will. Building confidence with preteens is one of the most important components in ensuring their success when they reach the high school level. Most schools have resources that will help with this transition, so get involved with your local school PTO or similar community organization and follow our tips to help your child prepare for high school and beyond.